The Vero Air complete bath is a further development of the Vero series from 2001. The angular shapes were retained and combined with the latest technical possibilities. Characterized thin edges and precise edges are possible as in the double sink with two single mixers. 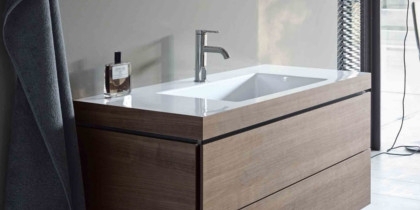 Here combined with the standing washbasin base in oak cashmere real wood veneer. With the rectangular ceramic and the rectangular furniture, Duravit brings a timeless character into the bathroom. The vanity units are available in 31 finishes, including American walnut real wood veneer, chestnut dark decor, white lilac silk matte or cappuccino high gloss varnish. Choose between real wood veneer, varnish in matte and glossy and a decorative panel. The cabinets offer different design possibilities: standing or wall-hung, with a sliding door or drawers, open compartments or with integrated towel holder. The upper drawers already have a siphon cut, but a space saving siphon is recommended as a supplement. Furnishing systems in the drawers can be combined, but must be planned and ordered from the outset. They are available in walnut or maple. 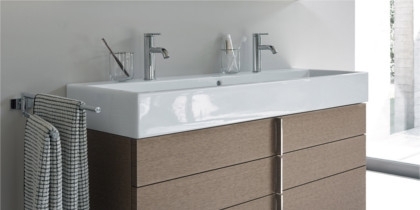 The design of the washbasin cabinets is a mix of a casual and easy design. It is lightened by a chrome-colored handle strip in the center of the drawers or in the case of smaller cabinets on the left side of the door. The sizes are based according to the vanities and go up to 1184 x 431 mm. 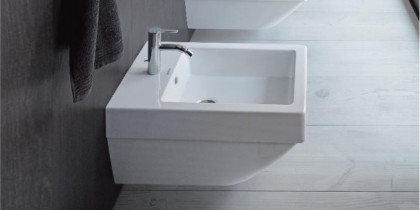 The square or rectangular washbasins of the Vero series have been reworked and now have a slightly lowered rear edge of the inner basin and a newly positioned drain. In addition, the contours have become leaner and more precise. In combination with the vanity units, the washbasins get a millimeter overhang which emphasizes the straightforwardness addition. The washbasins from sanitary ceramics are available in lengths from 450 mm up to 1200 mm, the width is 470 mm for most of the washbasins. The larger basin can be fitted with two single-hole mixer, so two people can use it simultaneously. Most washbasins of the Vero Air series have a tap hole bench with an already pierced tap hole or three tap holes. The variant 600 x 380 mm does not have a tap hole bench and can be combined with a freestanding or a wall-mounted fitting. For an even longer clean surface, the washbasins are also available with the special Duravit WonderGliss surface. Like the rest of the ceramic series, the Vero Air WCs and bidets are also square-shaped and slowly round to the floor. All the latest techniques such as Rimless®, Hygiene Glaze 2.0 or SensoWash® Slim are available. For the first time, it is possible to build a square flush-proof toilet so that it produces perfect washing results. The toilet seat can be easily and quickly removed for cleaning with the help of push buttons and then put on again. The ceramic coating Hygiene Glaze, burned into the surface, offers additional hygiene, which significantly reduces bacteria. 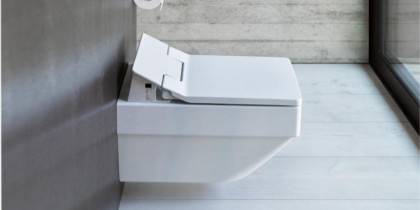 Thanks to connection components for SensoWash, the WC from the Vero Air series can be combined with the WC seat SensoWash® Slim, making it to a practical shower-toilet. The Vero Air Series includes both bathtubs and whirlpools in size from 1700 mm to 1900 mm x 700 mm to 900 mm. Different installation variants are possible: built-in bathtub, freestanding bathtub or a pre-wall version. All models are available with wall or floor bathtub spout. The floor inlet is located in the middle of the tub or on the edge, of which the backrest also depends: bathtubs with a backrest have the spout on the side without slant, tubs with two backrests have the spout in the middle so that the comfortable lying position is not disturbed. The edge of the tubs is especially narrow with 55 mm and provides more space inside. As a combination Duravit recommends the fittings of the series C.1 and the bathroom furniture of the series Vero as well as L-Cube. A combination with the c-bonded technology is also possible, with the sink and the cabinet almost seamlessly melt together.